The 4 ball is on the rail about 1/2 an inch from the tip of the side pocket. The 2 and 4 are frozen straight across the table. The 1 and 5 balls are frozen off center of the side pocket about 1/8 inch out from the rail. The 3 ball is frozen to the 5 and dead about 1 inch from the corner pocket. Balls must be in this order to go in rotation. Hit the cue ball a little above center aiming the 2 ball at diamond no. 2. Hitting the shot too hard can cause a miss. Three out of five of these balls were not dead, but had to be thrown into their pockets. 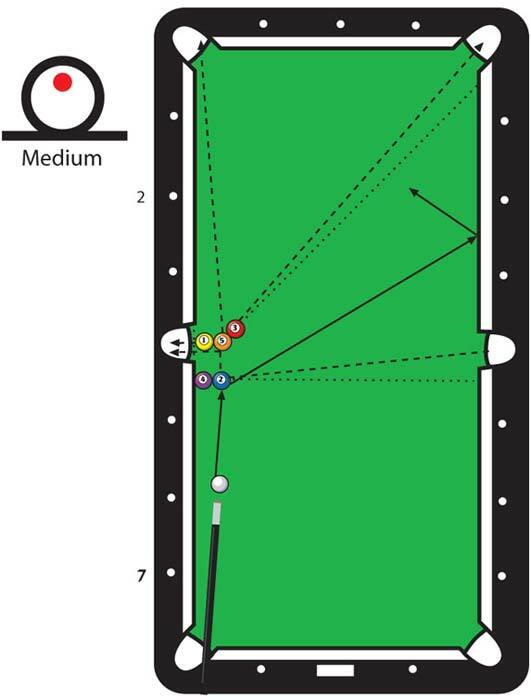 Tapping the balls into the table enables a fast repeat set up.